We delivered the design and construction of 21 no. 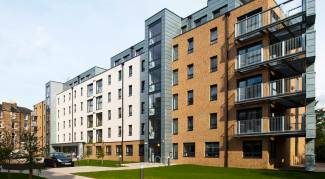 new student flats over five floors, comprising 76 bed spaces with associated connecting services and landscaping. 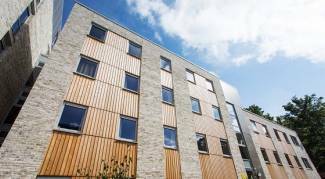 The structure of the building is constructed using a five storey lightweight steel frame and is externally finished in a pallet of high quality finishes such as brick and block work, render, timber cladding and curtain glazing. The project was initially designed as a structural steel frame with SFS infill panel. However throughout the procurement process, we identified that the costs associated with this design were pushing the project over budget. We undertook a value engineering exercise – which delayed the start of the project – to identify a suitable substitute. We changed the frame structure to a lightweight steel frame solution. Although this impacted on programme initially, we were able to mitigate delays in the programme due to a reduction in the construction period. We recently delivered a project for the same client and design team in Inverness which was constructed using a lightweight steel frame. 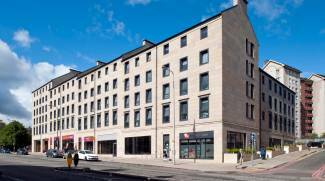 We were able to apply the methodology from this project to King Street, Aberdeen. We understood the importance of minimising the number of subcontractors on site for the steel frame, and thus subcontracted the frame to one steel subcontractor which was been extremely effective in the management on-site and the productivity levelsOn the delivery of King Street, our formal change procedure has been implemented on this project. We understand the importance of accurate cost reporting with clear and timely feedback to the client team is essential. We accurately priced specification changes and variations as soon as possible to allow the client to make informed decisions on the variations quickly and with a full understanding of their commercial implications. We have adopted a partnership approach of collaborative working on the project providing early warning of any commercial threats and at all times worked proactively to avoid disputes, which has been extremely successful to date. To reduce costs, we have worked in partnership with the Architect and Client to identify the most effective cost savings. We identified that need to re-design the project from En-Suite Bathrooms to Shared Bathrooms to ensure sufficient cost reduction, which has been achieved.